Last week, a Tohono O’odham citizen was struck by a Customs and Border Protection vehicle on his nation’s reservation in southern Arizona. 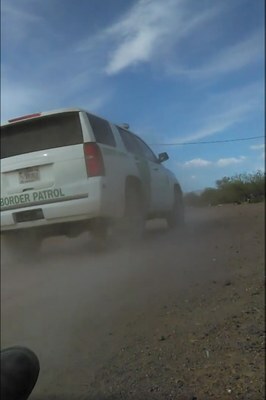 In cell phone footage of the incident, the Border Patrol SUV never stops, leaving the scene at a casual pace immediately after striking Paulo Remes. Remes was treated and released from a local hospital, and the Tohono O’odham Nation says it has opened a criminal investigation into the incident and is being assisted by federal authorities. The foot of Paulo Remes can be seen as he lies on the ground after a Border Patrol vehicle hit him, then drove away, on the Tohono O’odham Nation. The Tohono O’odham Nation is the second largest reservation in the United States. The Nation shares almost 80 miles of its border with Mexico. The O’odham’s traditional homelands extend far into Mexico as does many of its tribal members. If you ask tribal members on the Tohono O’odham reservation about the Border Patrol incident, or other reservations where tribal citizens encounter law enforcement for that matter, you will likely hear something along the lines of “this kind of behavior isn’t new; what’s new are the cell phones.” Native Americans have long been harassed by authorities, but now those incidents are more likely to be captured on video. Incidents like these further erode trust between law enforcement and the communities they are tasked with protecting. According to the U.S. Department of Justice, Native American men are the most likely to be shot by police. A recent NPR survey found that more than half of Native Americans living in majority Native areas reported they have experienced discrimination from law enforcement. A third of those polled said that as a result they avoid calling the police even when they need assistance. Think about that: The U.S.-Mexico-Tohono O’odham border is one of the most active corridors for illegal activities along the international boundary and is regarded as a threat to national security by the Trump administration. Yet the community there — which is most affected by crime and in the greatest position to help law enforcement keep the border safe — is afraid to call the police. The Tohono O’odham have a complicated relationship with the U.S.’s southern border that goes much deeper than tensions with the Border Patrol. The tribe is a good illustration of America’s legacy of drawing lines between communities in an effort to divide people by race. Tribal members have traveled across their lands and the modern-day border for generations. Outside questions over security and immigration have created new difficulties for the tribe, and Trump’s proposed border wall has exacerbated those tensions. The Tohono O’odham are living examples of how the distinction Americans make between “Mexican” and “Indigenous” is often not reflective of history or culture. The idea that we all come from one place is a defining principle of many tribal belief systems. Our cultures and traditions may vary from tribe to tribe, but “we all come from one fire,” as I have heard my Cherokee elders say. Two of the legacies of colonialism that endure are the ideas that tribal sovereignty means little and simultaneously that there is an “us” and there is a “them.” When you see someone as “the other,” it becomes much easier to vilify or persecute them. Indigenous people know this tactic well, and the Tohono O’odham are now recording and sharing it. Colonial and imperial violence is a scourge. It dominates land, divides communities, incites genocide and perpetuates violence even today. It is why Indigenous people continue to endure high rates of violence, and, one could argue, why law enforcement feels emboldened to run us over with impunity. Do you think, given our history with the federal government, it’s a surprise that a border patrol agent felt empowered to strike a Tohono O’odham tribal member with their SUV and simply drive away?